Presidential candidate and front-runner Andres Manuel Lopez Obrador delivers a speech during a rally in Guadalajara on Feb. 11. On Wednesday, he said of Cambridge Analytica: "Now that it's a worldwide scandal, people are finally paying attention." Candidates in Mexico's volatile presidential race are scrambling to distance themselves from the disgraced big-data firm Cambridge Analytica. Executives of the company boasted on tape, secretly recorded by a British TV station, of their ability to influence elections in numerous countries including Mexico. Cambridge Analytica — which is being scrutinized for its ties to Facebook and the Trump campaign in the U.S. — had set up shop in Mexico, even partnering with a local data mining app. But once that secret tape emerged, the major presidential candidates were quick to declare their campaigns hadn't hired or received data from the company. 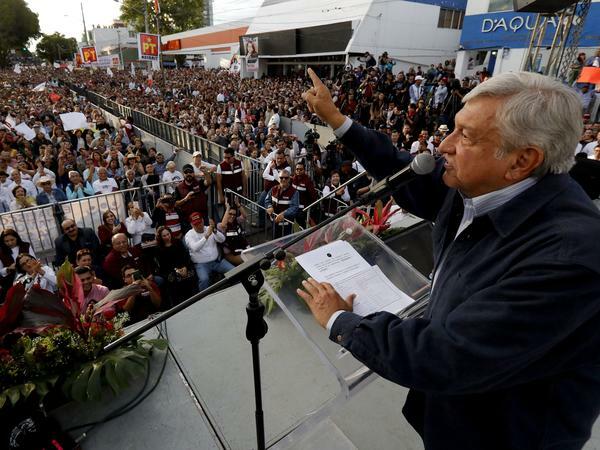 Presidential candidate and current front-runner Andres Manuel Lopez Obrador, of the leftist Morena Party, told reporters Wednesday that he warned Mexicans about Cambridge Analytica working in the country months ago. "Now that it's a worldwide scandal," he said, "people are finally paying attention." In October, an executive with Cambridge Analytica placed an ad on Facebook recruiting workers to head up political campaigns around the country and in Mexico City, according to BuzzFeed. That same executive was also pictured at a cultural event sponsored by a top senator of the opposition PAN party. "We have had no contracts with the firm," says PAN's candidate, Ricardo Anaya. "I believe there needs to be energetic action taken on the part of governments around the world to protect people's privacy from these types of companies." The head of Mexico's National Electoral Institute, known in Spanish as INE, says the regulating agency has no knowledge of Cambridge Analytica operations in the country. All political contractors must register with INE. Cambridge Analytica did not come up in NPR's search of INE's contractor database. That's despite Cambridge Analytica's Mexico office hailing its partnership last year with a phone app called Pig.gi. The app, with nearly a million Mexican subscribers, gives free airtime to users in exchange for taking surveys and watching ads. At the time of the partnership announcement, Cambridge Analytica told Bloomberg it was going to use Pig.gi data to help a candidate in Mexico. Pig.gi co-founder Isaac Phillips says Cambridge Analytica did invest in the app and had talked about developing special programs. "But that never progressed and never happened and since these allegations came out over the weekend, we've taken steps to formally end that relationship so that they will no longer be a provider," Phillips says. Pig.gi did provide data to Cambridge Analytica from two presidential polls it ran, but Phillips says no personal data from the app is ever shared. Pig.gi is also not listed as a political contractor in the Mexican election regulator's database. Cambridge Analytica did not respond to multiple requests for comment. While no evidence has surfaced of Cambridge Analytica's meddling in Mexican elections, the allegations have been front page news. Political scientist and historian Javier Buenrostro says the public is skeptical, especially since punishment for breaking electoral laws is weak. "It's a fine of $10,000, but for a marketing or a for brand or for a politician who is going to lose or win the election, $10,000 is worth it," he says. And Buenrostro adds it's common for politicians to hide illegal activity by using subcontractors and a web of fake companies. The ruling party's presidential hopeful, Jose Antonio Meade, was asked Wednesday whether he was using the practice in his campaign. "No, here we are not octopuses nor have tentacles in those practices." Meade said. Currently, he's trailing in third place in the presidential race. Now to Mexico. Candidates in that country's upcoming presidential race have voiced concerns about the activities of the data mining firm Cambridge Analytica. Politicians there are vehemently denying any contact with the disgraced company. As NPR's Carrie Kahn reports from Mexico City, that is despite evidence Cambridge Analytica set up shop in the country and partnered with a local data mining app. CARRIE KAHN, BYLINE: It didn't take long after a secret tape emerged of Cambridge Analytica executives bragging about influencing elections in Mexico for all the major presidential candidates to declare their camps hadn't hired or received data from the company. KAHN: Presidential candidate and current front-runner Andres Manuel Lopez Obrador told reporters yesterday that he had warned Mexicans about Cambridge Analytica working here months ago. Now that it's a worldwide scandal, he says, people are finally paying attention. Last October, an executive with Cambridge Analytica placed an ad on Facebook recruiting workers to head up political campaigns around the country. According to BuzzFeed, that same executive was also pictured at a cultural event sponsored by a top senator of the opposition PAN party. KAHN: The PAN's candidate, Ricardo Anaya, told reporters that his party or campaign has had no contracts with the big data firm. The app with nearly a million Mexican subscribers gives free airtime to users in exchange for taking surveys and watching ads. At the time of the partnership, Cambridge Analytica told Bloomberg it was going to use Pig.gi data to help out a candidate in Mexico. Pig.gi co-founder Isaac Phillips says Cambridge Analytica did invest in the app and had talked about developing special programs. ISAAC PHILLIPS: But that never progressed and never happened. And since these allegations came out over the weekend, we've taken steps to formally end that relationship so that they will no longer be a provider. KAHN: The app did provide data to Cambridge Analytica from two presidential polls that ran, but Phillips says no personal data from the app is ever shared. Cambridge Analytica did not respond to multiple requests for comment about the story. While no evidence has surfaced of Cambridge Analytica's meddling in Mexican elections, the allegations have been front-page news. Political scientist and historian Javier Buenrostro says the public is skeptical, especially since punishment for breaking electoral laws is weak here. JAVIER BUENROSTRO: It's a fine of $10,000. But for a marketing or for a brand or for a politician who is going to lose or win the election, $10,000 is worth it. KAHN: And he says it's common for politicians to hide illegal activity by using subcontractors and a web of fake companies. The ruling party's presidential hopeful, Jose Antonio Meade, was asked just yesterday whether he was using the practice in his campaign. JOSE ANTONIO MEADE: (Speaking Spanish). KAHN: "No, here we are not octopuses nor have tentacles in those practices," said Meade. He's currently trailing in third place. Carrie Kahn, NPR News, Mexico City. (SOUNDBITE OF LITTLE PEOPLE'S "MEZZO") Transcript provided by NPR, Copyright NPR.